No Podcast for this One! The last time I posted on this blog was the last time I felt apart of this world. It’s influenza season, and you know what that means—literally everyone and their mom is sick. Literally. I think I know exactly what let my bug through my (usually) impenetrable defenses, though, and it’s all my fault. The Saturday that I posted, was a great day, but I stayed up literally all night because of my sleep in. It upset my schedule in a way that couldn’t readily be repaired, and I think late in the night, the flu crawled into my body and began to seize power. I was okay on Sunday. I went to bed at seven a.m., for what seems like a power nap, because I had coffee plans at ten. During that time and immediately afterwards I felt it coming on. I lamented to my mom that night, half laying on the kitchen counter, that, “I better not be getting sick.” By the middle of the night, it was obvious. Monday I was plagued by random waves of vertigo and nausea; thus, began a vicious three-day cycle. 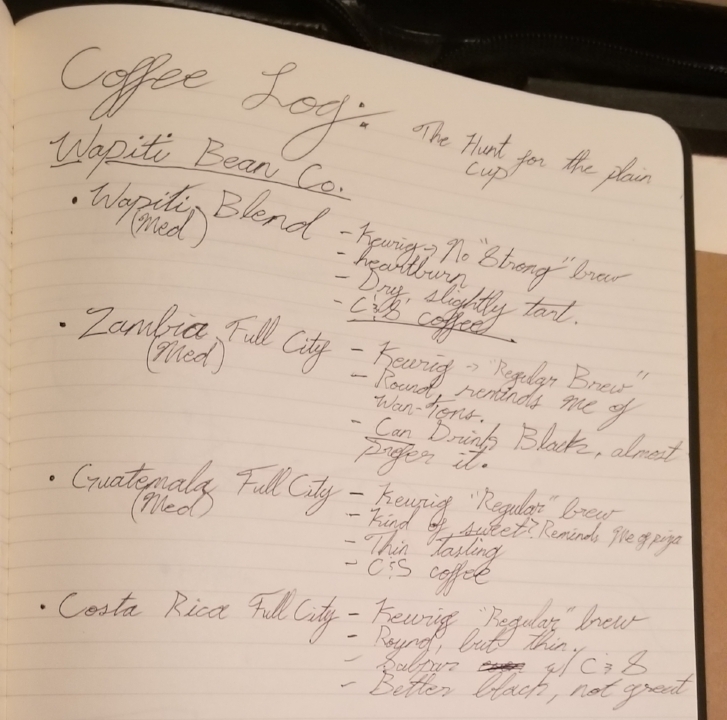 In that post from Saturday, I mention that I was about to start work on a post about coffee, and I did that. I wrote most of everything, and how coffee plays into my current obsession—but I didn’t have the energy to record an episode of the podcast, so I let it sit. Now it’s Wednesday evening and after being in bed since Sunday and feeling like the kid from The Secret Garden—I’m restless. While in bed all that time, I absorbed Bon Appétit’s YouTube channel, along with Hot Ones and The Patriot Act with Hasan Minhaj on Netflix—all with a trusty bucket by my side and a fan on my face while wrapped in a blanket. There’s been a lot of input and literally no output (save for liquid) from me. It’s fractured me in odd ways. I can’t remember if it was in the insomniac haze of Saturday night, or in the slick and sweaty fever-dream—but I ordered a camcorder on Amazon. I remember a very handsome man with dark skin and bright eyes in the lobby of my building, and suddenly there’s an alert from my bank asking if t’was I who bought this irregular item. Shut up, guys—yeah it was me, I’m trying to live my dream. Okay? Am I allowed to do that, Visa? It may be a fever dream, but that doesn’t make it any less real. I don’t know what got into me, but I’m impulsive as hell when I’m sick. I always have been, and I think it must have been something about watching all of these shows on YouTube lately. They all feel so… doable? I have a great capacity to think about how great I am when I’m sick. It’s like every cell in body calls out for normalcy and in doing so, they drive my ambition. You may have noticed that the website you’re reading on looks different. That’s because one of the few things I could do with this nausea on Monday was point and click—so in ready for my “new vision” I got the site in line with the feel I want on the videos. I planned an entire new phase of Fat Dog from my bed, and it was all spawned by this damn coffee post, flu-laden delirium and charismatic boys and girls on YouTube. I feel okay as I write this, getting out of the house to go to the clinic was a good move and feels like it brought me back to life. The constant feeling of being on a boat in the cold while sweating is still there, but I have supreme confidence that I’ll be able to rejoin the ranks of the upright tomorrow. But first, let’s talk about coffee. Last Christmas, I was given a coffee grinder. I had expressed a desire about trying out new types of coffee in search of something I could drink black. Since day one, coffee and I have been at odds—I love the stuff, but I absolutely need cream and/or sugar. That was until I went to Cuba. The coffee there is deep and rich and doesn’t need anything added to it. There’s just something about the brew that captured my imagination, and I started a short journey to find the same at home. Along with the coffee grinder, I was given a pound of that good good: four bags, quarter pounds of whole roasted beans. They were all from the Wapiti Bean Co., a local company here in Grande Prairie. I was given the Wapiti Blend, Zambia Full City, Guatemala Full City and Costa Rica Full City—now, what full city means, I had no idea, but that was the point to all of this: to learn. Full City is a roasting technique, something I picked up with a quick little google search. That’s the best part of the world we live in, people are sharing absolutely everything, and when it comes to food and drink, the internet is a deep, deep well of knowledge and opinions. I believe my first mistake was trying them all from a Keurig. I should have waited until I got the French press, which came later. Once I got that, all sorts of ideas sprang to life. There’s something so very relaxing about making French press coffee. Once you grind your beans, it’s a nearly silent process. Water boils, you let the grind steep, and then plunge. It’s simple and produces the best coffee you can imagine. The liquid is dark and rich, just like I wanted, and though it was good enough to drink black, I started buying rich cream to pair. The visual of the cream spreading through the dark ignited ideas in my head, and being the person that I am, they were all projects. As a kid, I used to love cooking shows. One of my baby sitters at home was The Inn Chef, hosted by Chef Michael Smith. He was smooth, soft-spoken, tall and made interesting food that was fun to watch and looked delicious. Once I met my father’s friend Brian, though, everything changed. I don’t know if he did it professionally, but Brian was like a master chef when I was a kid. The man loved food more than most people love anything, he was vocal when he ate, and a genius in the kitchen. He showed me how to make simple things, like chip dip with sour cream and soup mix. He was a big man, like my father, and for some reason, opposed to my athletic and lean step-dad, I felt very akin to him. I was a heavy kid, plagued by insecurity, but he was a living example of how to carry it well. After filling my head with little recipes and stoking a fire in me, Brian went back to his home with his wife, reappearing for the occasional holiday here and there. I started playing with the family video camera, making little movies with my action figures. I always wanted to make a cooking show, but for some reason, just never did. Watching the thick cream diffuse in the coffee brought all my visual dreams back to life, blending them with the experience of doing podcasts in the years prior. The idea for my coffee show was born. I have pages and pages of planning, potential guests and coffees. I have a list of the equipment I needed for the idea—something that’s changed slightly but has been pulled ever closer by technology. The place I live now is absolutely great for shooting, and this camera that appeared in my hands the other day is my gateway in. It’s exciting to be able to finally bring all of this to light, especially because it helps me meet people. I’m going to reach out to the Wapiti Bean folks, as well as some other local businesses in town, and see if the old Fat Dog can’t start participating in the growing culture of Grande Prairie. All of these projects and “shows” I’ve dreamed up are half excuses to have both audio and video to edit, and half an excuse to hang out with and meet people. Doing this blog and podcast is great and fun and all, but I’m too much of a people person to keep working alone. Writing is for the solitary moments, which are important, but if I’m going to start writing about coffee and cannabis, you best believe that I’m going to have some friends there with me.